“We encourage the development of third party certification schemes to provide businesses with peace of mind that they are choosing a competent supplier. The rapidly growing fire risk assessment consultancy market is unregulated and confusing for buyers – this is a potentially dangerous situation, as incorrect advice may be given by unqualified consultants. 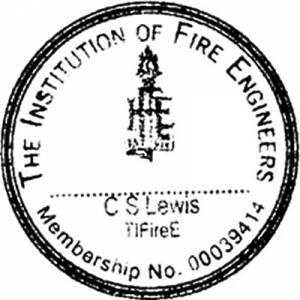 London Fire Risk Assessments was one of the first to be represented on the Institution of Fire Engineers list of Fire Safety Consultants, having already been one of the first Companies to be registered on their list of Auditors and Assessors. The Director of London Fire Risk Assessments, built on his knowledge and experience as a Watch Manager A, Fire Safety, London Fire Brigade Inspecting Officer, to gain accreditation with the Institution of Fire Engineers as a Life Safety, Fire Risk Assessment Auditor. He is only the second person in London and the South-East to have done so, and one of the first to qualify as both an Auditor and subsequently an Assessor. If you have employed a third party, Competent Person in the past we are best placed to audit their output and tell you if it was money well spent. If either they or you have collated and compiled your Fire Risk Assessment, we can tell you if it would be deemed to be suitable and sufficient. Your Fire Safety documentation may be out of date, it may no longer be valid and, or it may be based upon repelled legislation. We can audit the documentation and where necessary and appropriate Review and Revise it. We do not limit our Audit and Review services to documentation but will review process and procedures, systems and strategies, Any Passive and, or Active Fire Safety requirements, recommendations and routines. We have over Eight years of experience in Audits and Reviews as, by legislative requirement, we have offered this to our existing Clients since our inception.